A scientific invention consists of six (or some number) ideas, five of which are absurd but which, with the addition of the sixth and enough rearrangement of the combinations, results in something no one has thought of before. As quoted in Robert Coughlan, 'Dr. Edward Teller’s Magnificent Obsession', Life (6 Sep 1954), 66. I can’t recall a single problem in my life, of any sort, that I ever started on that I didn't solve, or prove that I couldn’t solve it. I never let up, until I had done everything that I could think of, no matter how absurd it might seem as a means to the end I was after. I told [Kruesi] I was going to record talking, and then have the machine talk back. He thought it absurd. However, it was finished, the foil was put on; I then shouted “Mary had a little lamb,” etc. I adjusted the reproducer, and the machine reproduced it perfectly. 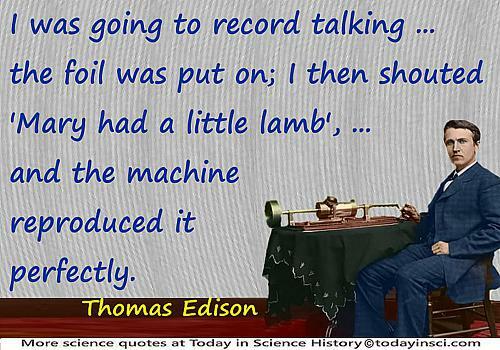 On first words spoken on a phonograph. Byron M. Vanderbilt, Thomas Edison, Chemist (1971), 99. If at first, the idea is not absurd, there is no hope for it. In Marc J. Madou, Fundamentals of Microfabrication: the Science of Miniaturization (2nd ed., 2002), 535. Only one who attempts the absurd is capable of achieving the impossible. 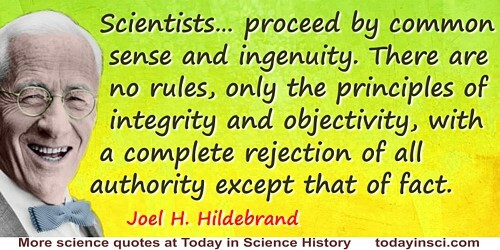 Scientific method is often defined as if it were a set procedure, to be learned, like a recipe, as if anyone could like a recipe, as if anyone could become a scientist simply by learning the method. This is as absurd ... [so I shall not] discuss scientific method, but rather the methods of scientists. We proceed by common sense and ingenuity. There are no rules, only the principles of integrity and objectivity, with a complete rejection of all authority except that of fact. In Science in the Making (1957), 8. Seven Lectures on Shakespeare and Milton (1856) 24. Letter to Charles Kingsley (5 May 1863). In L. Huxley, The Life and Letters of Thomas Henry Huxley (1903), Vol. 1, 347. To suppose that the eye, with all its inimitable contrivances for adjusting the focus to different distances, for admitting different amounts of light, and for the correction of spherical and chromatic aberration, could have been formed by natural selection, seems, I freely confess, absurd in the highest possible degree. When it was first said that the sun stood still and the world turned round, the common sense of mankind declared the doctrine false; but the old saying of Vox populi, vox Dei, as every philosopher knows, cannot be trusted in science. Reason tells me, that if numerous gradations from a perfect and complex eye to one very imperfect and simple, each grade being useful to its possessor, can be shown to exist; if further, the eye does vary ever so slightly, and the variations be inherited, which is certainly the case; and if any variation or modification in the organ be ever useful to an animal under changing conditions of life, then the difficulty of believing that a perfect and complex eye could be formed by natural selection, though insuperable by our imagination, can hardly be considered real. On The Origin of Species by Means of Natural Selection (1859, 1882), 143-144. We must keep our freedom of mind, … and must believe that in nature what is absurd, according to our theories, is not always impossible. Whenever the essential nature of things is analysed by the intellect, it must seem absurd or paradoxical. This has always been recognized by the mystics, but has become a problem in science only very recently. In The Tao of Physics (1975), 50. ~~[Misattributed]~~ Only those who attempt the absurd will achieve the impossible. No known primary source exists for this quote in Escher’s works. It is likely misattributed from a quote by Miguel de Unamuno translated as, “Only one who attempts the absurd is capable of achieving the impossible.” See the Miguel de Unamuno Quotes page on this site. … There can be no doubt about faith and not reason being the ultima ratio. Even Euclid, who has laid himself as little open to the charge of credulity as any writer who ever lived, cannot get beyond this. He has no demonstrable first premise. He requires postulates and axioms which transcend demonstration, and without which he can do nothing. His superstructure indeed is demonstration, but his ground his faith. Nor again can he get further than telling a man he is a fool if he persists in differing from him. He says “which is absurd,” and declines to discuss the matter further. Faith and authority, therefore, prove to be as necessary for him as for anyone else. In The Way of All Flesh (1917), 319-320.